Bringing Audiotoop back home. That is what this book is about. Audiotoop is not 'just' a live event, held in a particular place at a given time. That's only one half of the story. The book is the other half. As much as Audiotoop is not a radioplay, it's not 'just' an event either. Audiotoop is like a biotop: it's an environment, completly packed with colours, sounds, people, and installations full of possibillities. That makes up the story that is brought to you. 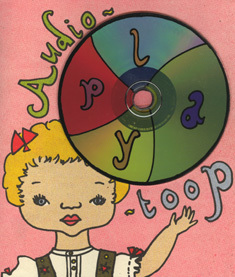 Right from the start, early 2005, Audiotoop is a live event with radioplays, closely-linked artforms and a cd/book. Early 2005 we invited various artists to present some form of radioplay, to be brought in a live context. How this is to be done, is up to the artists, but the visual element is to be reduced, not to be ignored. On a given night, we see for instance a table filled with turntables, childrens toys, flutes, violin, drums, effects. Or the findings of a scrap yard. People dressed up like english teachers. For instance. All to make the illusive sounds to create a world around the story. One or more persons sitting behind and telling a story, because it's the story that matters. Sometimes the audience plays the (in-)voluntary role, taking part in a never practised dramatic murder play. Sometimes the stories are illuminated by singing, drawings or simply a powerpoint presentation. To expand on the idea of stories, several installations were presented, such as the abstract band of Freek Lomme: 'bass, bass, drums, bass, guitar, bass'. Perhaps without the involvement of any living person, such as the mummified drums, complete with dancing nails and hair, as presented by Quinten Dierick. Extrapool becoming the biotop of Audiotoop when it all turned black and white, complete with noise and fluorescent paint. All gone and not to be repeated. The book is the same biotop: it presents an environment of it's own. With it's studioversions, live registrations and especially designed artworks and texts. A big 'thanks' to everyone who participated and for now: open the environment, step in and enjoy. This book (17x19 cm) has 28 pages, printed in full color by Knust, of texts and collages by the various artists. The CD has eleven tracks by Jana & Bertin, Jan Schellink, The Bohman Brothers, Freek Lomme & Remco van Bladel, Quinten Dierick, Jorg Piringer & Elffriede, Jeroen Kuster, Lem & Lemoineau, Marten de Wind & Tamar Frank and Vernon & Burns. Texts in English, German and Dutch and sometimes even no text.